With the launch of the new line of hand stamped jewelry, there were always plans to add more fun and unique hand stamped items to the line-up. The newest addition? 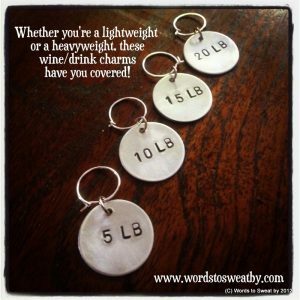 Wine and drink charms that are health and fitness inspired just in time for the holidays. At $9.75, these charms make a great hostess gift, stocking stuffer, or a simple ‘just because’ gift.